Firstly I would like to thank Steve on his great work of webmaster, I now realise the importance of gathering as much info as possible!! That point in mind, I will glean as much info and fill in the gaps from Nov to christmas, as and when. Nov raffle prize winners are, Adrian, Ian and Gill, photos to follow. Wow, can you believe it another AGM doesn't it come round so quick? true what my parents used to say, to older you get the faster it goes- its true. 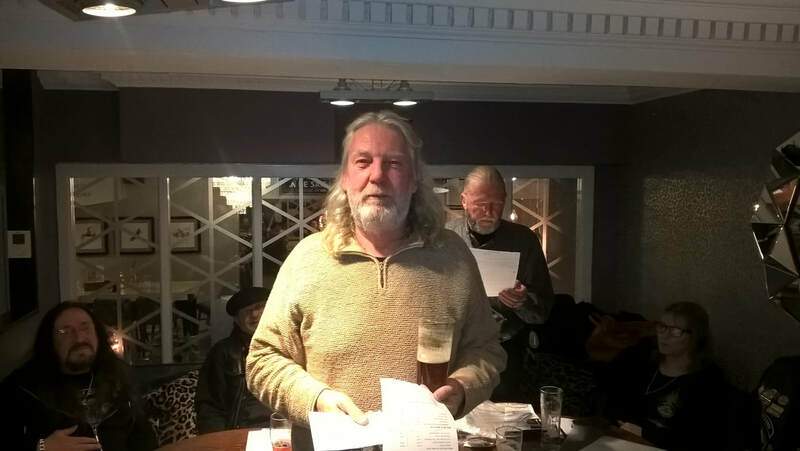 So the AGM, while 29, including the committee, turned up it was a disappointing turn out for the AGM, where were you all? this is your club and it needs everyone to participate. We started promptly at 8pm with Chris welcoming everyone and explaining how we'd started off as a Hog Chapter (actually a branch) and eventually became independent. As with all AGM's its when the present committee steps down and a new Committee is elected. All members were sent out forms to nominate themselves for a position we were overwhelmed by the lack of response. In fairness this is normal - a lot of people that would like to be on the committee won't volunteer in case they upset the current position holder if they have put their name forward again and it goes to the vote, which is fair enough! However there were three vacant positions this year, Secretary, Webmaster (yes yours truly is stepping down) and Club Photographer. We had one new name which was for Photographer. After Chris's introduction Mal informed everyone of the Xmas Party, this year to speed up the service at the hotel Mal has agreed to provide a list of what people want for starters and desert, so all those that re going to the party will have had an email from Mal with the options, please get your choices back to her ASAP if you haven't already. All the rooms that were on hold that haven't been taken by Rainy City have now been put back into the general reservation pot. You can still go to the party if you haven't yet booked but you will be at the mercy of the hotel room availability list. So if you want one get your order in asap, there is a minimum quality that hs to be ordered so don't just think about it - do it. Next Jon introduced the year bars, these are a little token we introduced a few years ago now. 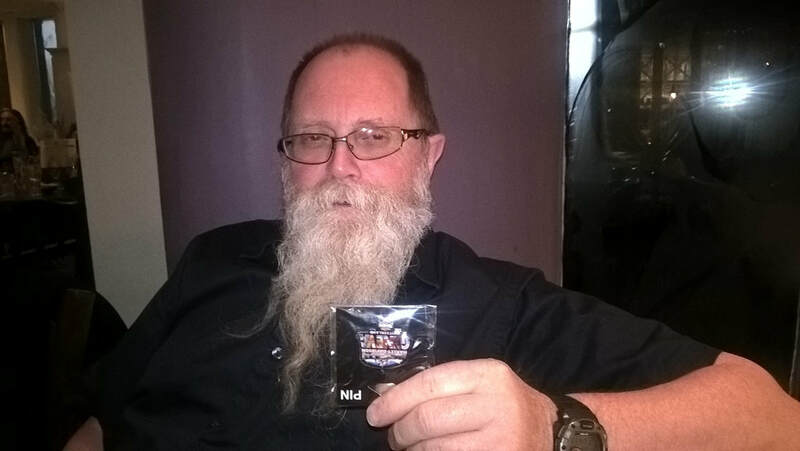 As part of your new members pack you get a RCHDC pin badge, this has two rings on it - ever wonder what they are for? well when you've been a member for 5, 10, 15 20 & 25 years you get a year bar to attach to the club badge showing how long you've been a continuous member for. So this year the members who were awarded are as follows. 15 Years (this is one that should have been given a couple of years ago, apologies). No 20 Year bars but we do have 25 years which have been renamed to Life bars for . Before the committee stepped down, each gave a report on their area of responsibility. The committee then stepped down and the new committee was elected, so, your new committee is as follows. Following on from the election of the new committee we had the members draw - you have to be there to be in it. This year it was won by Iain Ridwood - well done. And following that win, food was served. And so it came to pass for yet another year, so it's good bye from me and good bye from him. Kev took the floor this evening as Chris couldn't make it, unfortunately Hazel tripped and broke her arm quite badly, best wishes Hazel for a speedy recovery. Monty, one of your Road Captains made a request on behalf of the Road Captain team, if you intend to go on a ride out can you please text/phone or message the Road Captain for that particular redoubt to let them know you are going - by 6pm on the FRIDAY before! There have been a few ride outs recently where the Road Captain has made the effort to be there on time to lead the ride and no one turns up. So a wasted effort. If you do go on a ride out you will be awarded an extra raffle ticket at the AGM for the Members draw so increasing your chances of winning- and you know the members prize is worth having. Kev went through the flyers, check out the events page on the calendar. The Christmas Party Flyers are out so get yours and send it bask asap with your deposit. This year payment date is strict so if payment isn't made asap the Holiday Inn will put the rooms Mal has reserved back up for general sale. You've been warned. The Raffle losers were Steve & Helen, Stuart, & Nick. Yep this time we had loser prizes as we have merchandise stock 'extra' that needs to go. Well what a night or couple of months it's been so far, this weather is great and it brought 22 of you out plus 1 prospective member and quite a few of you were on your bikes which is alway good to see. Chris started the meeting advising those that were going on the biker down course that it was still on for the 1st despite his contact at the centre being off ill so everyone meet at Lymm truck stop from 11:30 and Montywill lead us to the Safety centre on Cliff Road. 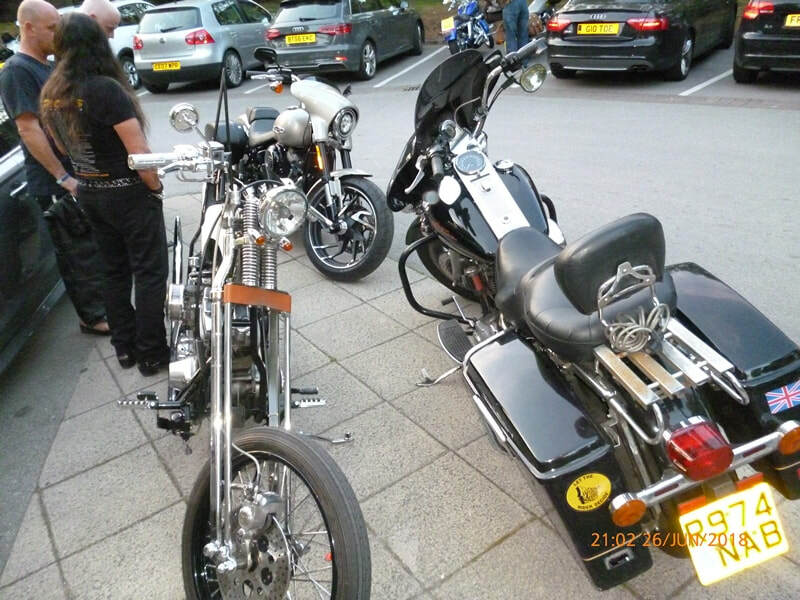 Monty read out the next weekends ride out which would be the 6th July, yep Saturday meeting at the new Mcr HD, then going onto Conwy. Kev in his usual jet lagged style; well he hadn't been in a plane but just got back from his and Kenny's 1 month tour of Russia, read through the list of events swith a mixture of regulars and some new events. Take a look at our calendar events page to check them out. Ken then took to the podium for the quiz, once the results were in we did the raffle and the winners were. 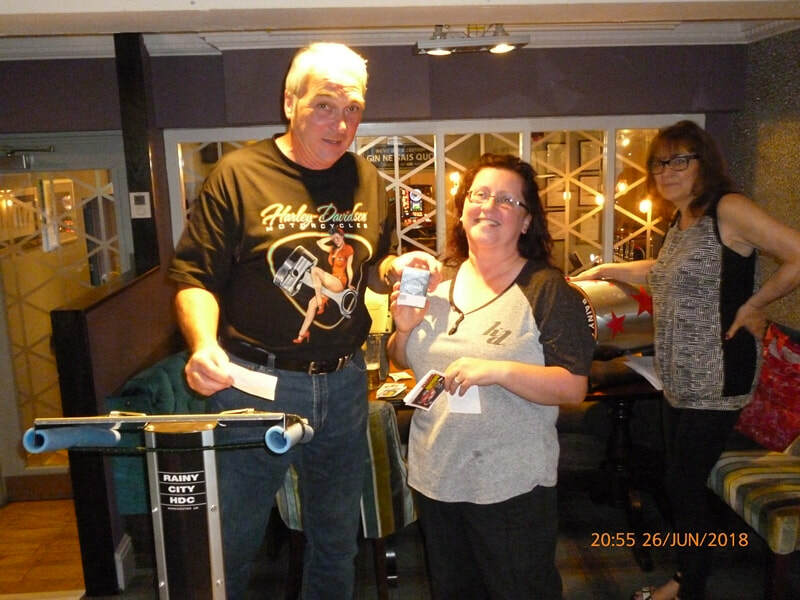 Here's Roger collecting the prize for his team which included Tracy and Lady Margaret. 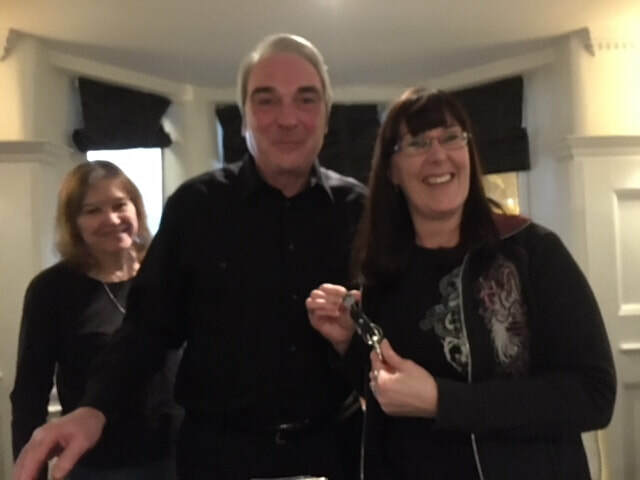 Helen won the first raffle prize. and Ian took the top prize. 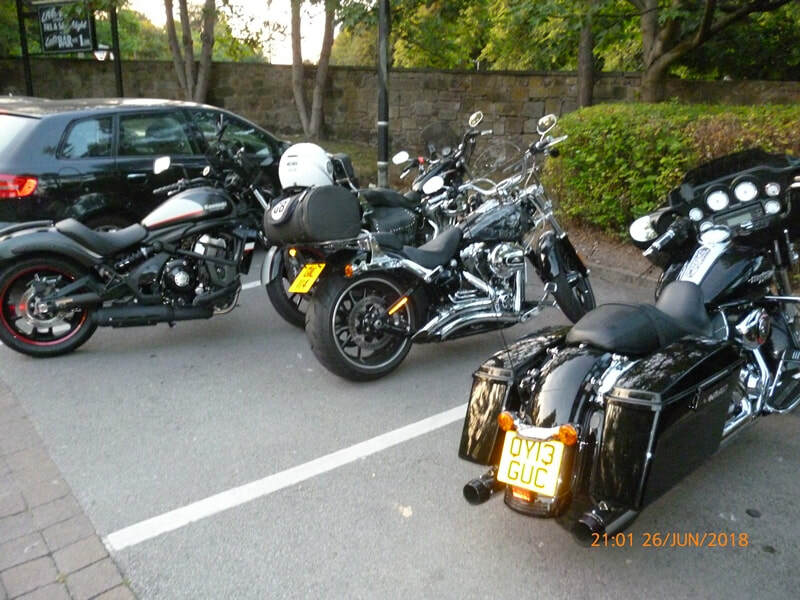 Look at some of the bike that turned up. Unfortunately or fortunately, which ever way you look at it I was on holiday for this meeting so I can give you any update. So the turn out seems to be gaining momentum, 26 braved the accident traffic on the M60 tonight - I was stationary for 20 minutes. 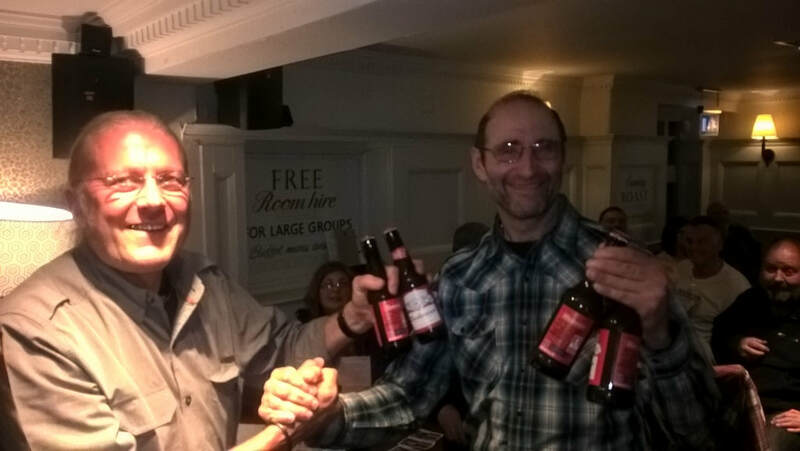 Fortunately it looked like the people in the accident were ok.
We had one of our new members turn up this evening for the first time, he joined last month! though he does live down sarf welcome Neil thanks for coming up and hope to see you again. This Saturday see's the Grand Opening of the new Manchester Harley Davidson, after about 3 1/2 years of delays its finally happening. 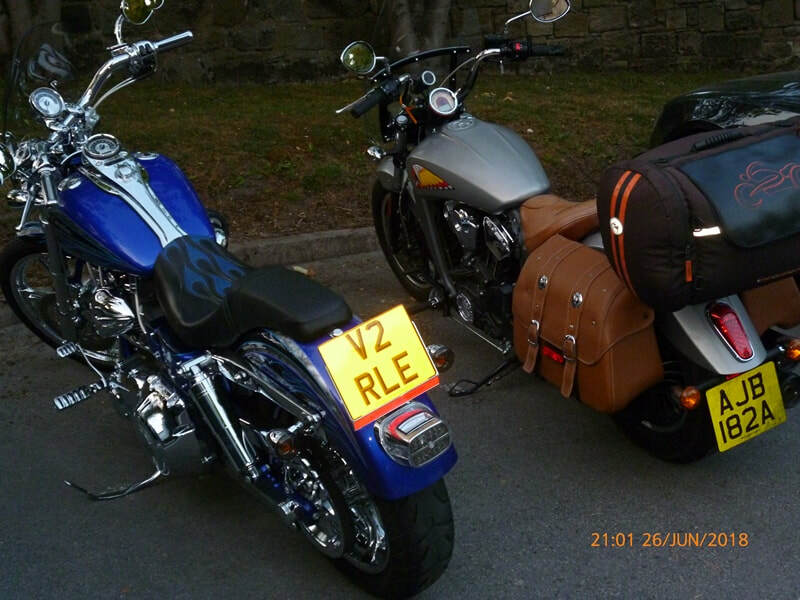 Those that want to ride together with us meet at Mal & Kev's at 10am. 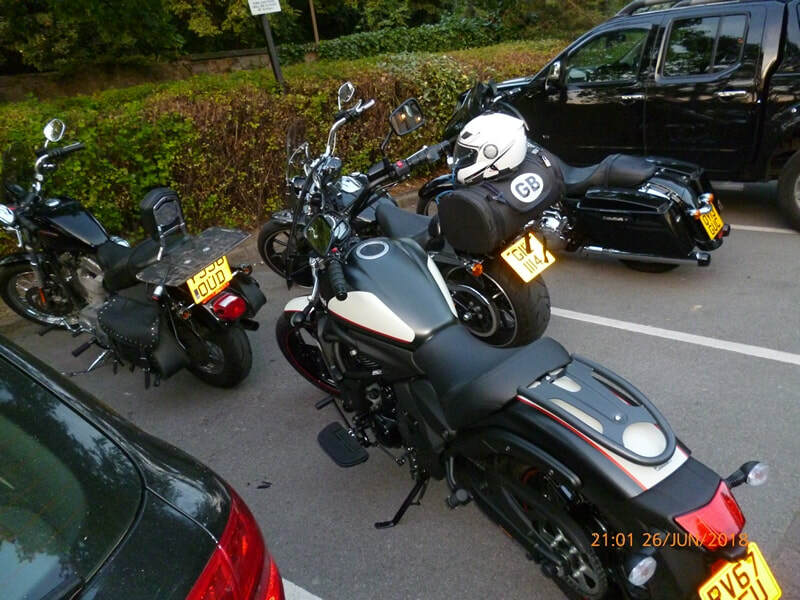 Chris advised that the biker down training was confirmed for 20 people - however there were only 11 places left..! By the end of the night there were only 7 places left. SO if you want to be included on the course get in touch with Chris Mac' SOON. For those going to the Kulture Kruise meet at Southbound Knutsford services 9.00 am for a prompt 9:30 leave on Friday 4th May. We also had a small presentation for Lady Margaret whose birthday it was and she's.... years young! Happy birthday. Any one wanting any more club pins pals get your orders in. 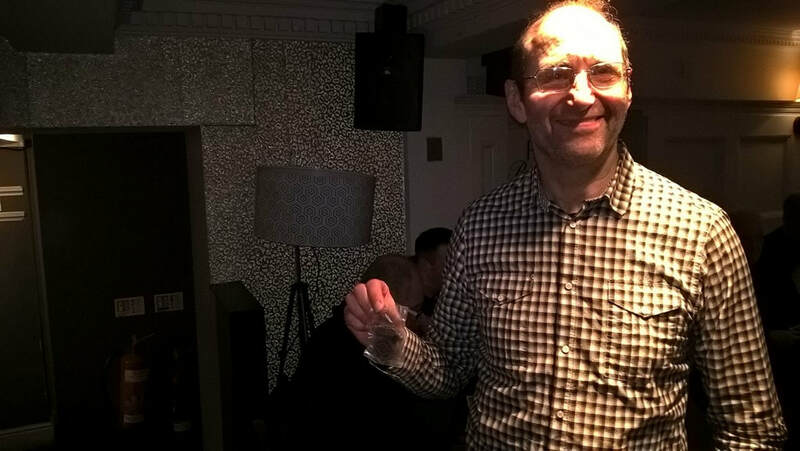 Adrian collecting the teams beer after winning the raffle - though he claims is all his own work. 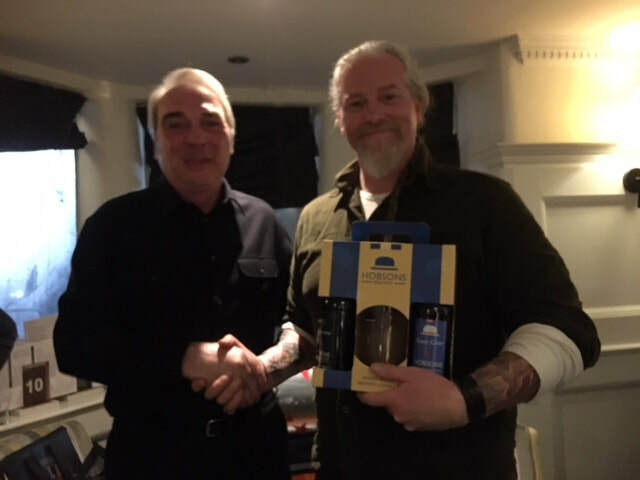 For once Barry wins a raffle prize - wakey wakey Barry. 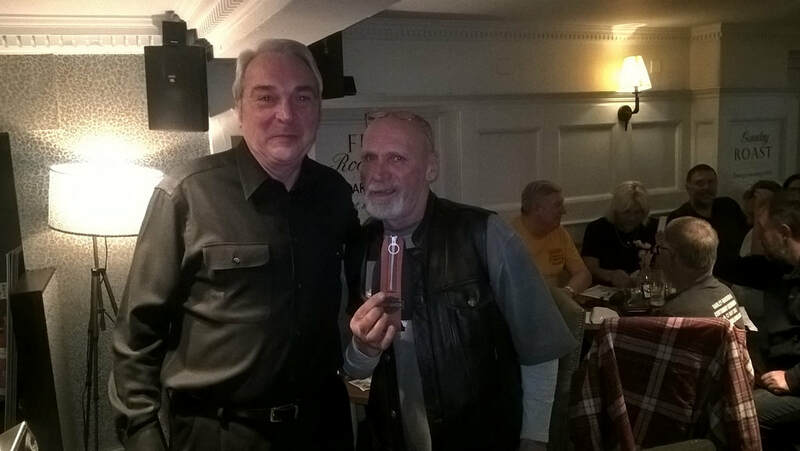 As Lady Margaret had one presentation she allowed Ken to collect her raffle prize. Smashing. Thats how is done Jeff. Only attends now and again but take a prize every time. Well done Jeff. With the better weather this month, compared to last month it was positively tropical, there was a good turn out 27 of you not bad - if this continues well need a bigger room. 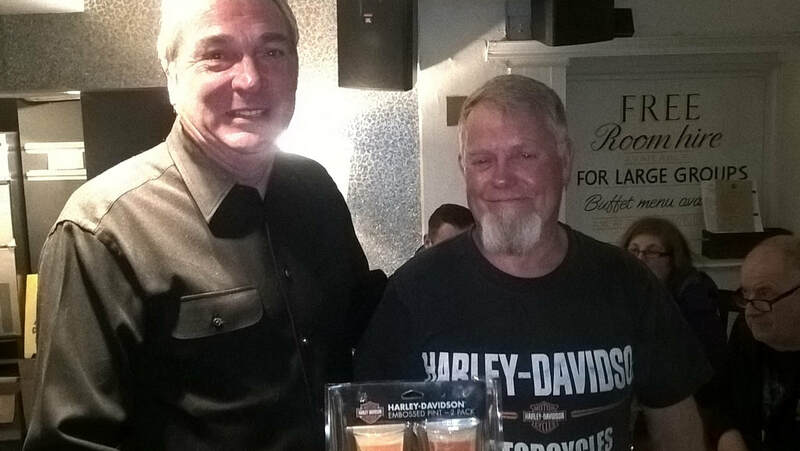 Chris took to the podium and started by thanking, on behalf of the committee, everyone that helped out at the Manchester bike show, that's everyone that help set up on the Friday, transported bikes, manned the stand and of course the hard bit packing up on the Sunday. Whilst not difficult is alway hard as it's the end of a long weekend and it's Sunday. So thanks again everyone. As mentioned part way through last year we are trying to get a course of 'Biker Down Training' organised the best date still available are 15th April, 20th May and 1st July but as places are limited please let one of the committee know asap if you wish to attend, and of course let them know which date. The course is free and will be held at Lymm truck stop. Chris entertained us with another of his instalments of the incorrect no. plate spacing, by the sounds of it there is more to come! Monty told us about the now annual Youthbike competition, where kids build a motor bike as a group which help with all types of social skills. There is the local competition on May 25th where if possible they would like as many people to turn up and watch the competition judging and maybe chat with the kids if you can turn up around 11:30 on the Friday morning. Contact Monty for further details. Kev gave a monthly review of the up and coming events all of which you can see on the events page. Ken gave us the quiz answers - though why, no-one apart from one team ever gets any high score! either its getting harder or we're all getting thicker!! So this time the prize went to the lowest score well the second lowest, as the lowest were too embarrassed to admit to it. Bill's great mate Mike Coyne. 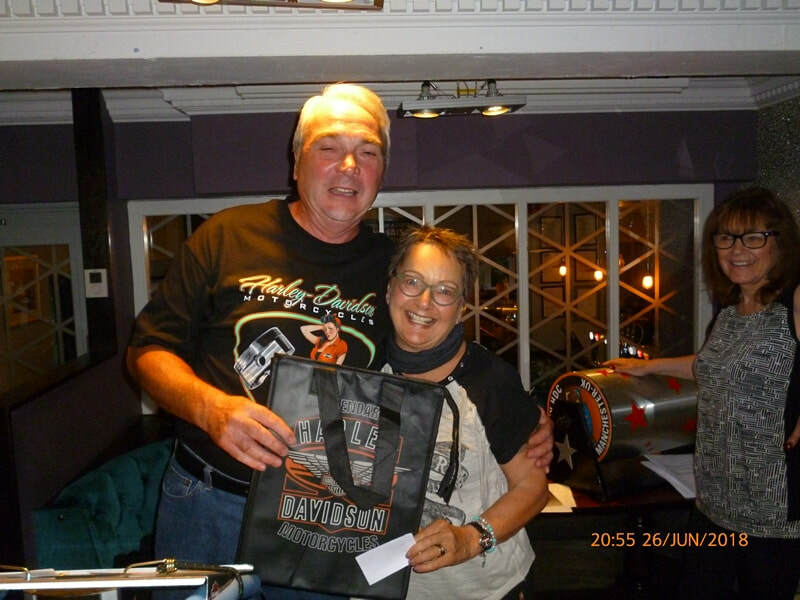 Winning our prizes and not a member - YET! And Steve - first one is it Steve? Need to buy more tickets. ​Considering the terrible weather conditions, we still had a reasonable turn-out of 20 odd hardy souls! Chris Mac opened proceedings with an update on his 'NUMBER PLATE SAGA', which is currently being considered for a mini-series on Netflix! The upshot is that it now runs to 7 foolscap folders and has run-up over 150 hours of 'valuable' police time - all for a £100 fine. Chris then handed over to JD, who clearly and concisely explained the forthcoming Data Protection laws and how they affect the running of Rainy City. Consent forms were handed round for those present to sign, while the rest of the membership will be receiving an email imminently. 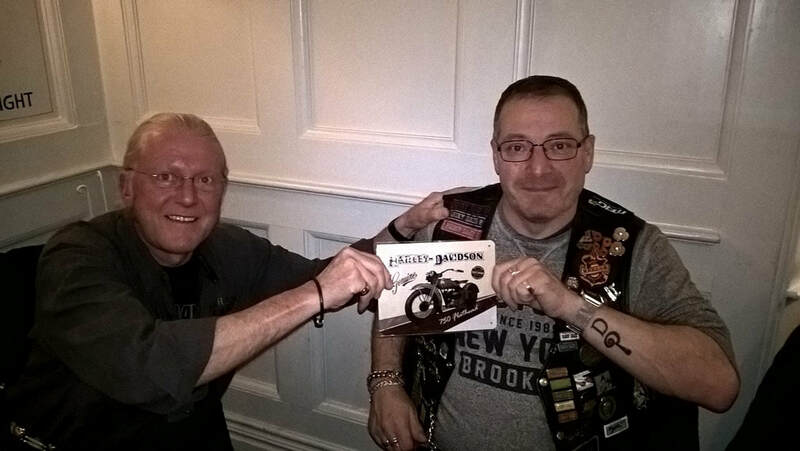 Kev then ran through a dozen flyers for upcoming events, whilst exchanging ribald banter with the various 'club comics' about his forthcoming trip to Russia on a Ural sidecar outfit, accompanied by his trusty 'Wingman/Idiot' Ken Vickery - watch this pace, Doubting Thomas's! Chris then returned to the lecturn and presented his fantastic MASSIVE MUSIC QUIZ. In response to criticism about the difficulty of his previous quiz, this one was even harder! It covered music tracks from the following genres; Stage Sows/Musicals, Detective Shows, Kids' TV and TV Dramas. Out of a possible 50 marks, Bill Malley's (massive) team won with a score of 35. And here is that MASSIVE winning team..! 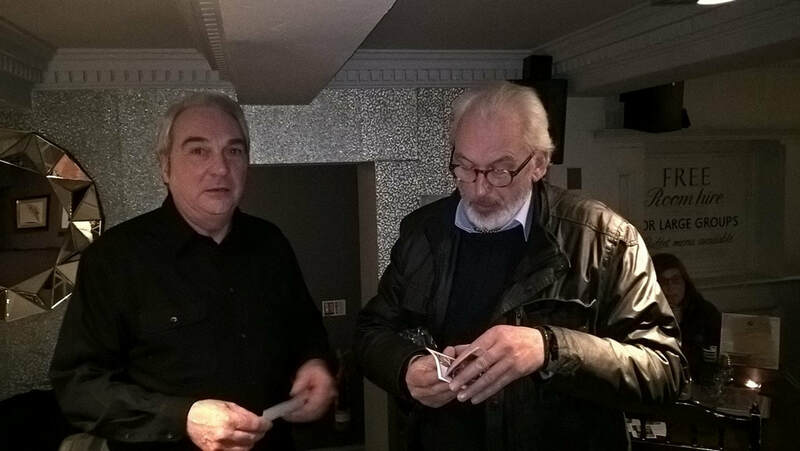 Mal and JD then organised the raffle and suggested folks beat a hasty retreat as it started to snow again. All-in-all, it was a really nice evening and had a very friendly and amusing atmosphere. Well a Happy New Year to everyone and here's to a happy riding 2018. 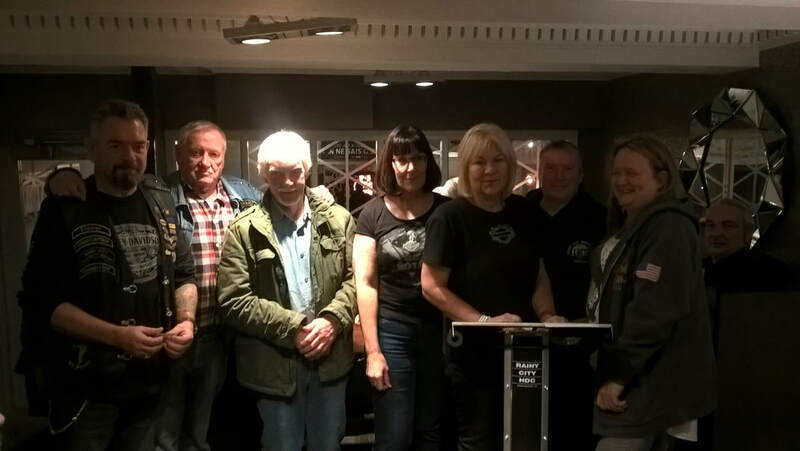 This was our first meeting of 2018 and to start the new year a fresh we were at our new venue as well The John Gilbert. For the first meeting of the new year it was well attended in fact I think we only just got everyone in. 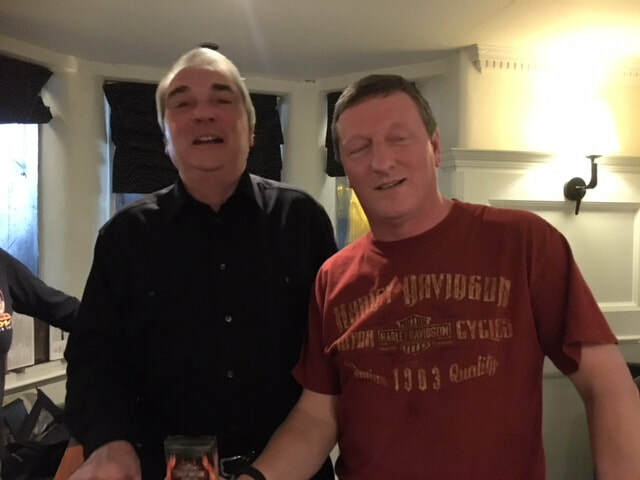 Moving the venue has also had the effect of bringing back some of the straddlers for the first time in a while Nigel & Mikey Hulme turned up and also a long time since we saw Martin Wood - its was good to see you guys. Lets hope this is the start of things to come. Chris started the meeting thanking Bill for finding the new venue. The next meeting will be music quiz taking in questions from stage, screen and TV so come on down for a great night. Kev headed up the next spot with the forth coming events he told us of a couple of new events coming upses the events page for the relevant flyers. The Manchester Bike Show is coming up soon and we need bikes for the stand, so as last year if you can spare your loved one for the weekend please let Mal know - you'll get free tickets for the show. 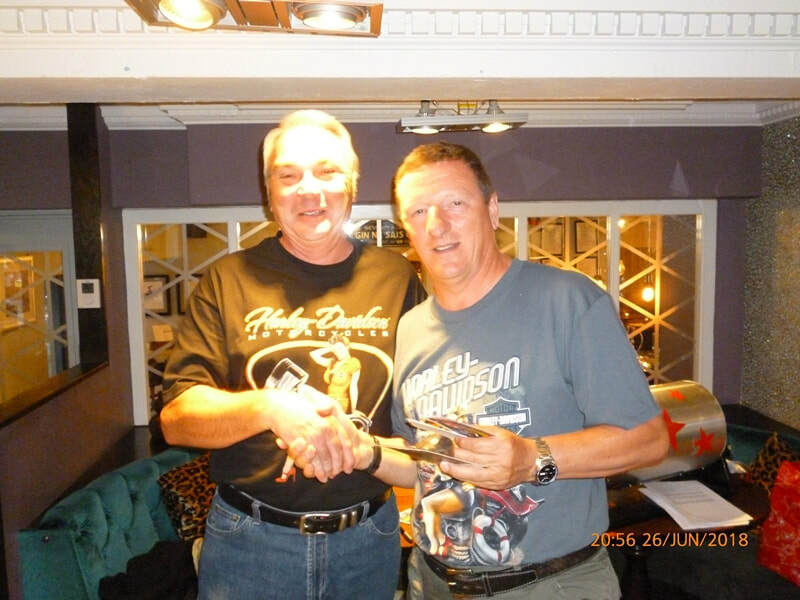 Bill Malley told us all about the club weekend which if you remember we've started doing as we now don't have Rainy Daze, in 2017 we were at the AACI summer Nationals in Kelmarsh Hall. The year Bill is organising a trip to the Hog 'n' Bog rally in Ireland. 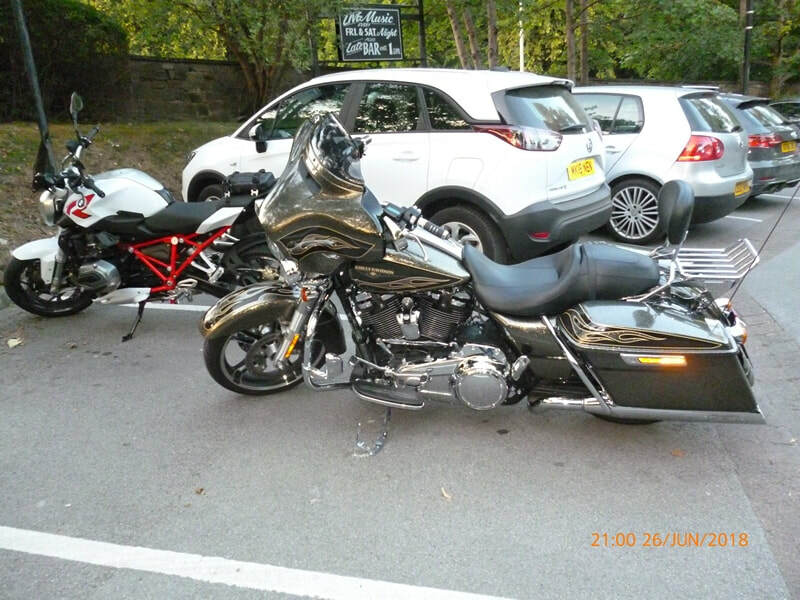 There are ride outs booked for the Sat & Sunday. If you fancy going key Bill know he has details of camping etc. 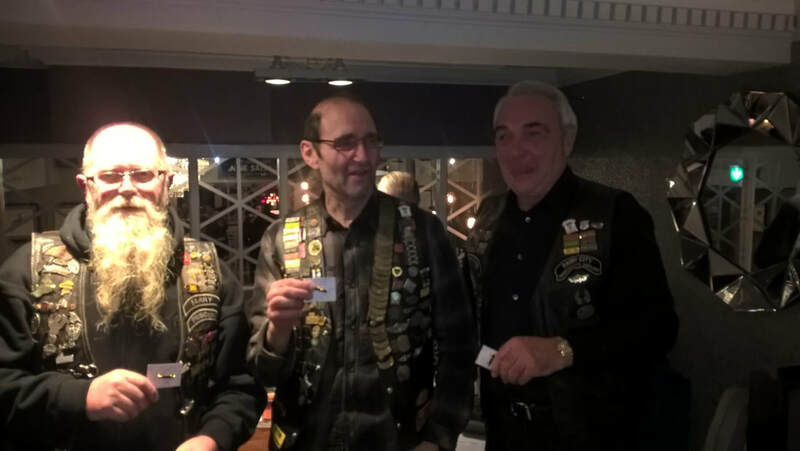 Monty gave us an update of the trip to Germany to visit the Spree Chapter, there are a couple of groups going this year one taking a leisurely two days to get there then there is a group doing the ride in the one day if you fancy going get in touch with Monty or Barry and they'll have the info you need. 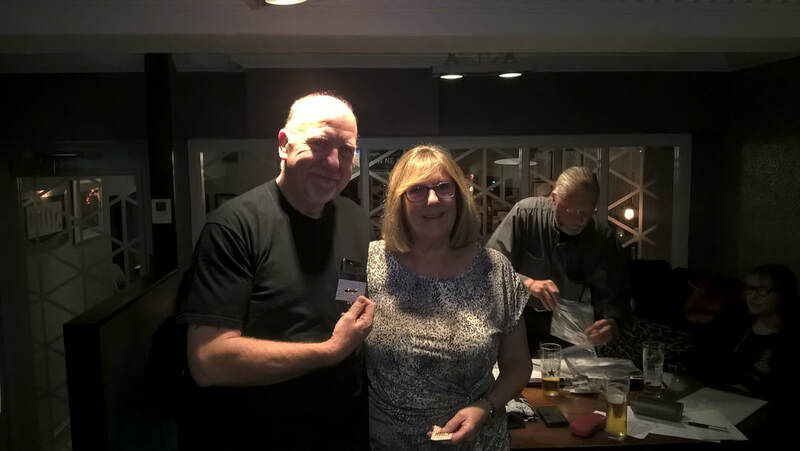 Jon handed out BMF membership cards to everyone and advised that as members we are entitled to discounts on events and other things the BMF offer please get in touch with Jon for the discount code. Another Ian winning - can you keep awake next time! First win of the year Alicia - and you look happy to have won. Martins started off how he finished last year - in the winners circle.